This was such a fun book! I've been hearing a lot about it, so I was thrilled to get my grubby hands on it at the library. I literally snatched it up with glee, then looked around to make sure no young people were going to give me puppy dog eyes. It has eight little comics in it, unrelated to one another (well, there is a little Lunch Lady cameo in the Babymouse short!) Each short comes from different creators -- some of the best-known names on the children's graphic novel scene. 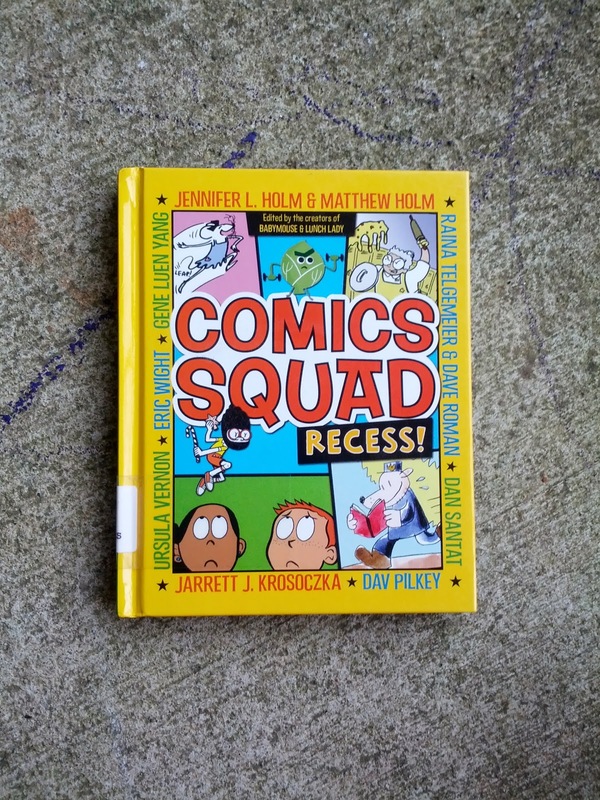 I read Comics Squad: Recess! in one sitting. It was such fun and so easy that I thought, "why stop reading?" Hopefully kids feel the same way. Levi, for one, was right next to me and insisted I read out loud. He loved the stories, though some of them were definitely over his 4-year-old head. I would put this book in the hands of strong 1st grade readers, on up through middle school. Levi particularly liked the Dav Pilkey's back-and-forth animation page, and exclaimed "Oh! That's how that works!" Benjamin is taking a peek at it as I type. Comics Squad: Recess! would be fantastic for teaching about art style, because it has eight different, unique styles. The collection showcases pencil work, pen work, watercolor, and digital art (and I might be missing something)! It would be *great* for compare/contrast activities. You can read my review of other works from Comics Squad: Recess! authors: Jennifer and Matthew Holm (Babymouse), Dave Roman (Astronaut Academy), and Raina Telgemeier (Smile), and Gene Luen Yang (Boxers and Saints). Eric Wight (Frankie Pickle books), Ursula Vernon (Dragonbreath books), Dan Santat (Sidekicks), and Jarrett Krosoczka (Lunch Lady books). The bottom line: So fun for kids, so perfect for educators. Sequels planned, I believe!